Labellevie 500Pcs 10 inch 100% Natural Bamboo BBQ Skewers | Fountain City Art Ctr. -Each bamboo skewer is carefully selected, clean, no split and no debris. 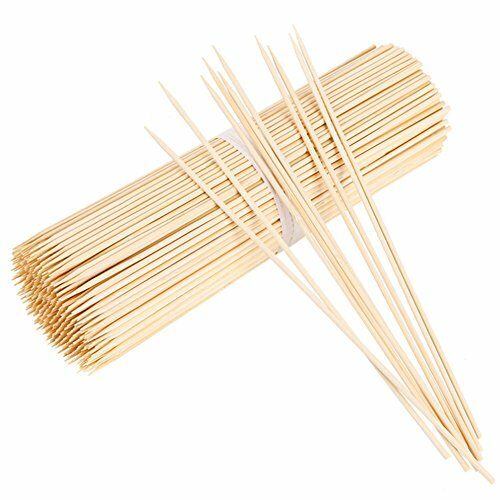 -Bamboo skewers for appetizer, cake decoration, cheese, cocktail,marshmallow, chocolate fountain, DIY design, flower gardening and handicraft production. BBQ skewers, fondue,grill sticks, fruit salad, roasting skewers for fish, seafood, hot dog, chicken, steak, vegetables, corn, etc. -Pure natural bamboo, without any addition, smooth surface, no burr, natural degradation material, give you the most safe guarantee. -It is suitable for every delicious kitchen. Camping picnics, barbecue parties, weddings, family gatherings, and friends' best choice. -Soak for 10 minutes before use. Best choice for barbecue stars and DIY masters. -Make sure to soak in water before grilling. Each bamboo skewer is carefully selected, clean, no split and no debris. Bamboo skewers for appetizer, cake decoration, cheese, cocktail,marshmallow, chocolate fountain, DIY design, flower gardening and handicraft production. BBQ skewers, fondue,grill sticks, fruit salad, roasting skewers for fish, seafood, hot dog, chicken, steak, vegetables, corn, etc. Pure natural bamboo, without any addition, smooth surface, no burr, natural degradation material, give you the most safe guarantee. It is suitable for every delicious kitchen. Camping picnics, barbecue parties, weddings, family gatherings, and friends' best choice. Soak for 10 minutes before use. Best choice for barbecue stars and DIY masters. If you have any questions about this product by Labellevie, contact us by completing and submitting the form below. If you are looking for a specif part number, please include it with your message.